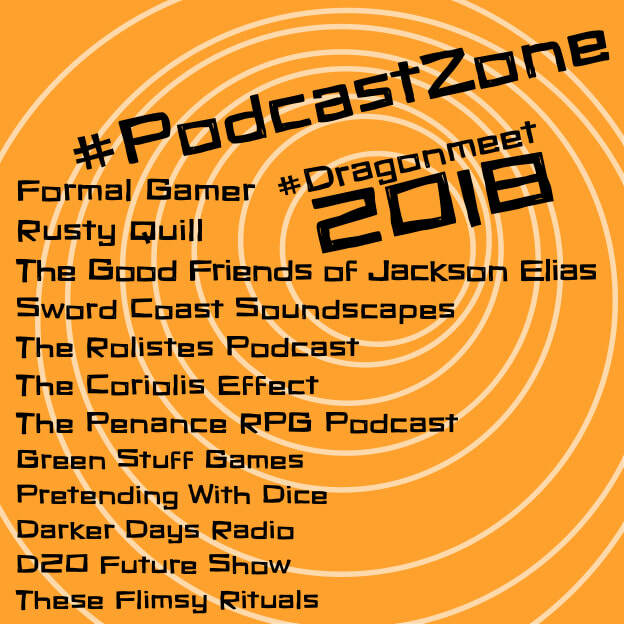 The Formal Gamer is an Actual Play RPG podcast that's been releasing weekly episodes since 2014. Each player takes it in turns DMing in our homebrew world, and chaos reigns supreme. From pear worshiping monks, a South African Goblin (who happen to be married to a weasel), to a Warforged with the mind of a two year old, we have hosts of great characters and enough of a back catalogue to keep you laughing all year. We are The Formal Gamer, a podcast for those with exquisite taste. Rusty Quill is a London-based podcast network & entertainment production house, with a focus on creating original, high-concept fiction media. Our current shows are the Rusty Quill Gaming Podcast, a Pathfinder Actual Play, and The Magnus Archives, a horror/mystery serial. And coming soon, Stellar Firma - a sci-fi semi-improvised show in space! The Good Friends of Jackson Elias is a fortnightly podcast about Call of Cthulhu and other RPGs, horror films, and weird fiction. Each episode covers a single topic which we use as a springboard for discussing ideas for games. And sometimes we sing. The three hosts -- Paul Fricker, Scott Dorward and Matt Sanderson -- are all freelance RPG writers who worked on the new edition of Call of Cthulhu. We have since collaborated on a number of other projects, including The Two-Headed Serpent, Nameless Horrors and World War Cthulhu: Cold War. Youtube Channel designing soundscapes for adventures around the sword coast. What is a Roliste? You are a Roliste! That’s what a roleplayer is called in French. The Rolistes Podcast is the proudly London-based show of Tabletop RPG fans across the Channel, the Pond and beyond. The show doesn’t only cross borders, but also languages, fandoms, game systems and settings. Each episode aims to surprise. They mix a variety of things together such as discussions, recordings travel-records, actual play, vox-populi, movie reviews, and even music by Creative Commons artists. Meet independent game designers, popular British publishers, immigrants or travellers visiting the Big Smoke. It is the show for YOU, no matter if you are a seasoned grognard or wannabe player who is about to take her first steps in The Hobby. You just need to be curious about what tabletop roleplaying games are played across the World, how they are played, and how different players' walks of life and interests can be. The Coriolis Effect was inspired by the launch in English of Free League’s mystical science factor game, Coriolis. Now, we cover all of Free League’s games, including Forbidden Lands, Tales from the Loop and, new recruit to the Free League food, Symbaroum! Every three weeks (or thereabouts) we release our magazine show, with news, articles and discussion of the rules and settings. In between we release warts and all Actual Play sessions, cut into hour(ish) long chunks to help you learn from our mistakes. Penance RPG is a rules light, Storytelling focused actual-play podcast using a homebuilt RPG engine. The aim is to allow the players free reign with both their approach to and methods of dealing with random situations, allowing both the cast & DM to interact together to weave more entertaining storylines and characters. They also adapt and rework well known existing stories – Such as Curse of Strahd - into a darker, more character-centric tale. Pretending With Dice are an Actual-Play podcast who play a variety of TTRPGs, including D&D, Star Wars: Saga Edition, Shadowrun and Star Trek Adventures. We are mostly story-focused, and rules-light in our approach; playing short story arcs and one-shots in each game system. Every episode features an original musical soundtrack composed by our GM, and a full immersive sound-effects audioscape to bring you right into the story. Darker Days Radio is focused on World of Darkness and Chronicles of Darkness games, plus other horror rpgs and some wargames. We tend to enjoy games that are fast to play, and focused on immersive horror themes, heavy on story and narrative, with room for character exploration. We also like games where rules help to reinforce the themes and moods of the game, and help promote roleplay that fits those game aspects. D20 Future Show is an ActualPlay podcast where the DM Richard and his team play the RPG D20 Future (based on D20 Modern) and are... well sometimes they are idiots. We hope you'll enjoy listening. Green Stuff Games is a YouTube channel which specialises in war games and other games with miniatures. These Flimsy Rituals is a narrative-first roleplaying podcast, focused on telling small stories in big worlds. We're currently playing Tiding — Challa, Belka, Bris & Venz lead their people through a world of restless gods and shifting landscapes. Remnants - ancient, unmoored colossi - shape the world in their image. A remnant of grief brings tears to the eyes of everyone within a hundred miles; the meadows near a remnant of repetition are filled with endless riffs on a single foxglove. Our stories are inspired by folklore, the wild landscape and works like Earthsea, Shadow of the Colossus and the Banner Saga. We're using a homebrew Powered by the Apocalypse hack, with traces of games like Saga's of the Icelanders, Monsterhearts and The Veil. New episodes every other Sunday, on most podcast sites. Links at anchor.fm/theseflimsyrituals. Follow us on twitter @flimsyrituals.